RIM has made some huge announcements - the first BlackBerry 10 devices are only expected to arrive in late 2012 because RIM wants to stuff them with LTE-equipped dual-core chips, and investors have quickly reacted to the news and shares of the Canadian company tumbled. There were plenty of interesting things the two co-executives said about the future of the company, but the first thing they did to try and soothe the reaction was cut their own salaries to a mere $1 a year. "To demonstrate our passion, alignment and commitment to RIM's long-term success, both Mike and I have asked the compensation committee to make a change to our cash compensation such that our salaries will be reduced to $1 a year, effective immediately," Balsillie said. Recently, investors have started mentioning that co-CEOs Mike Lazaridis and Jim Balsillie have to go, but after the earnings call it’s becoming obvious that the couple doesn’t plan on quitting. BlackBerry 10 Devices to arrive mid-late 2012 because of lack of integrated LTE/dual-core chipsets. From the beginning of 2012, RIM will be losing an estimated $100 million a quarter to aggressive advertising (mostly in the US), promotions to decrease costs of phones, discounted apps - a heavy push on marketing when products become less competitive. Mike and Jim are committed to the PlayBook, say its impossible to be making smartphones and NOT making tablets. Is the symbolical cut any indication of the company’s commitment or is it rather a pathetic excuse for not delivering in times when the smartphone market is moving to maturity? Drop us your two cents below. $1 a year? 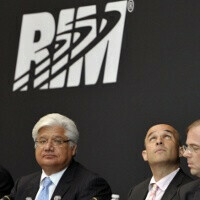 are you sure that isnt a typo or is RIM just that much of a failure? No one cares. You own so much stock that this is an affront. no, dont get excited guys. CEO's do that all the time. They make more money on dividends and bonuses then they do on their salaries. Its symbolic more than anything. The best thing that could happen would be these 2 yahoos getting the hell out of the way. Really?? late 2012 for "dual core" chips? you guys realize quad cores have launched already right?? what planet are you guys on???? "integrated LTE/dual-core chipsets" Learn to read, we don't have that yet. Qualcomm is already testing dual core versions of the S4 chip, which is the one with integrated processor/LTE. They are supposed to have the quad core version of that chip ready some time late Q1 2012 or early Q2 20120.
guys this far behind shouldnt be waiting for another year for a new technology. dual core AND LTE exist now. who cares if its integrated yet, 99% of customers sure as hell dont. Its just another excuse for "we are a bunch of screw ups that are intent on running RIM into the ground"
R I M SHOULD BE R I P .. MOMENT OF SILENCE TO THE DEATH OF BLACKBERRY BEFORE OUR EYES. WHERE HAVE THEY BEEN FOR THE LAST 3 YEARS. EATING I GUESS. Yeh so there making $1 but all of there expenses are being picked up by RIM. There going to be paid based on a deferred compensation structure. So they may get $10,000,000 in shares but they dont make any money unless the stock price goes up and if and when they sell they only pay taxes on the profits. So those 2 better hope that RIM is able to get there new products out as quickly as possible or 2012 will be awful.